As I said, the first four issues are by John Wagner. The Megazine floppies have featured the nineties Harlem Heroes and Flesh reboots (5 books), Valkyries, and Judy Janus (2 books). I'd still say that the non-Legends of the Law DC Dredd was worse than all of those, both in terms of script and art. JH Williams III's Judge Dredd is definitely better than Carl Critchlow's coffee ground palette or Siku hurriedly painting over Kev Hopgood. Helfer's VR storyline was misbegotten, but the Ministry Of Fear put anything I was reading in 2000ad at that time in the shade, in terms of art, story, or originality. 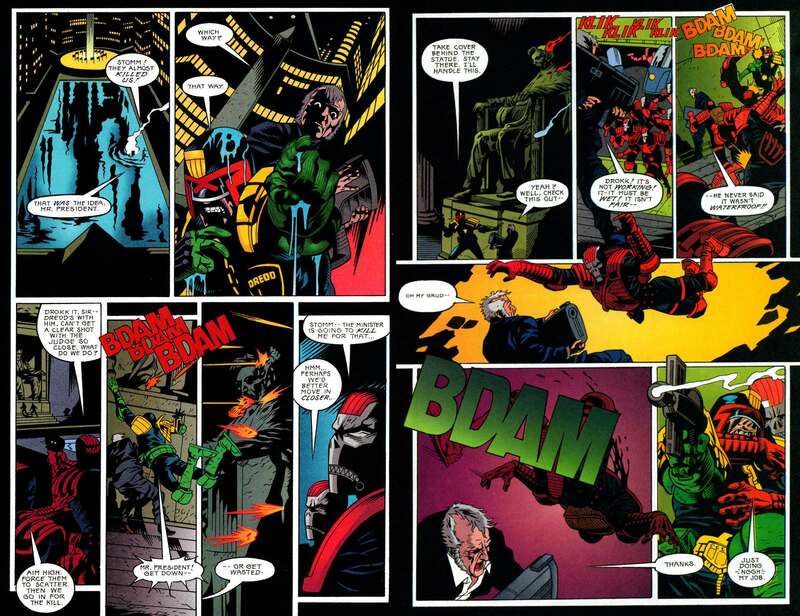 In 1994-1995, 2000ad and DC Dredd both featured storylines about a Justice Department coup. Wagner's version is a conversation in a car park, Helfers is skull-masked terrorists tearing around on alt-lawmasters and storming the Senate on zip wires. ... or for the previous four years. If you own Case Files 16-23 you own many, many worse strips than Helfer Dredd. NB: I'm not making an impassioned plea for these stories to be reprinted; I'm responding to the suggestion that the reason they haven't been collected is their quality or their interest to readers. ... and the President of the USA blasting invaders on the capitol steps, using alien weaponry! As an explanation of how Justice Department seized control in Megacity One, Helfer's tale of a psychotic Vice President Booth as Fargo's stooge is not in any way definitive. It is, however, more lively and engaging than anything in Origins except the Cadet Dredd (and Rico) episodes. Helfer's decision to relocate Dredd at the beginning of Justice Department's hegemony always felt awkward, but it demonstrates why sections of Origins where Dredd's telling his team stories by the campfire never really come to life. Like the Cadet Dredd episodes of Origins, the Ministry Of Fear material works because Dredd's an active participant in an action-based storyline. It also claims that TV Comic, Countdown and TV Action are owned by Reach plc / the Mirror Group. For what it's worth this probably isn't a huge coup for the Mirror Group as nearly all of the strips in those comics (I think?) were licensed, and are almost certainly owned by whoever owns the property itself. The Thunderbirds strips for example will be owned by whoever owns the Thunderbirds property (ITV? Some sort of Gerry Anderson holding group? I dunno) etc. etc. Same applies to Rebellion's recently acquired Look-In unfortunately. We're there *any* strips in Look-in that weren't adaptations of some TV property or another?? I suppose the (slightly) silver lining here is that Rebellion are certainly the best placed to publish any reprints of those Look-in strips should they want to, but they'd for sure have to enter into a new licensing agreement with whoever the owners are. John Grant's 1994 licenced Judge Dredd novel The Hundredfold Problem was republished in 2003 with all references to the Mega-City One 'verse removed. Judges Dredd and Callisto were replaced by Dave Knuckle and Petulia McTavish. The Doctor Who novel, The Burning Heart was supposed to be a crossover with Judge Dredd but after the failure of the 1995 movie, Dredd was replaced with Adjudicator Joseph Craator.